I find myself struggling to juggle and focus in the way that I used to. I prided myself on my ability to switch between my various headspaces as quickly as I wanted to – work, photography business, websites I’m a part of running – and to be able to pick up where I left of and to pursue that line of thought as long as I wanted to. Then the most wonderful thing happened – we had Eli. The amount of changes that have happened to our life are amazing, and I still don’t even have my head wrapped around all of them. Changes that have been good and bad, challenging and joyous. Challenges that should be chronicled another time, though. The surprising one has been my inability to just direct my mind in a certain direction, and let it loose: to dream, plan, critique, and create. The struggle has come to a head recently, and it has (coincidentally enough) been in my thoughts a fair bit. I’m sure that Eli is not the only contributing factor. Part of it has to do with the place that work is in right now. So many changes have occurred to my job over the last year that my position description now (again) no longer reflects what I actually do. Blissfully, a lot of the crap has been cut from my job, and I’m able to solely focus on the parts that I love, and the parts that stretch me. On top of all that, the changes that are happening to our workplace mean that everything is up for grabs – including the opportunity to start afresh on many aspects that have become either run down over time, or completely neglected or ignored. At the junction of the two changes is me: the new role has me doing a lot more creative and deadline work, and at the same time I have the opportunity to be researching and presenting and pleading the case for things I see we need to be doing that we just flat out aren’t. There are simple, simple things that an organisation of our standing should be doing, which haven’t even been discussed – and we now have the opportunity to look into them. Again, in the forefront of all of those opportunities is me, with the chance to begin to widen the scope of our work, and enhance the quality and professionalism of what we do. All of that requires time. Time not just to research, collate, present and enact, but time to think. This is where the struggle lands me. There are these marvelous opportunities to push the envelope and in the process push the limits of my professional abilities, and they all require the time and headspace to even begin to do them justice. Don’t get me wrong, the creative work I get to do is fantastic, and barring the odd logistical headache, enjoyable as hell. But having the ability to dream big has me excited about my career in a way I haven’t been for a while. I want to give my headspace over to this to do it justice, but I struggle to find the ability to do that. And all of this is from my nine-to-five job. The real complicating factor is when you begin to add in the other aspects of my life that require major headspace. I run a photography business on the side. I have clients to deal with, photos to edit, shots to prepare for and actually shoot, a new assistant to encourage, grow and adjust to shooting with someone else, all on top of the other work. I’m part of a team that runs an online community that is undergoing a time of major change and development, and requires thought to go into the future direction we should take. There’s documents to read and ingest, and responses to plan for an upcoming meeting. Not to mention the day to day keeping up with the site itself. I’m also a dad. A dad who gets to work the majority of his time from home, which puts me in the luckiest bracket going. I’m above all of that a husband. All of these things vie for that seemingly ever-diminishing headspace, in a battle that seems to be only ever increasing in intensity. We just spent eight days on holiday down in Anglesea, and after finally sitting down and worrying about nothing more than meals, Eli, and whether to sit in the sun or the shade, I realised that I needed to stop. It even took me five days before I made this startling realisation, that I needed to slow down, and to breathe. All of those things are a part of my life, that isn’t going to change. But they all also require me to prioritise where my time and headspace to go, and not to let them dictate that to me. I made this frame of Eli one morning after breakfast. We were camped in amongst these trees that provided shade in the morning (bliss when sleeping under canvas in Summer), and some respite from the coastal wind. 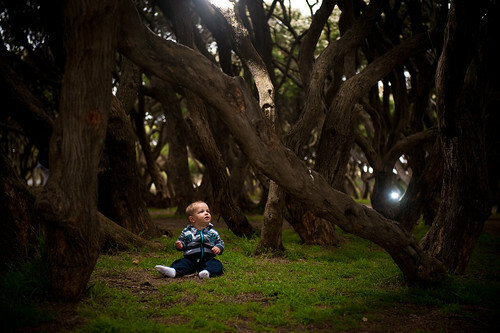 Sitting amongst them, feeding Eli his breakfast, the idea came to mind of the image: a child surrounded by twisted, dark trees, but not overcome by them – curious and brave and with a nature of exploration. And that was the particular moment when it all clicked. That is an amazing photograph.